I arrived this afternoon in Jerusalem to begin the latest round of geological study of the Jurassic System in Israel. It was a tedious ten-hour flight from Newark, New Jersey, to Tel Aviv (although not nearly as long in the air as our Wooster colleagues spent on the Hales Fund China Trip, which is still in progress and has a great blog), followed by an hour’s ride in a mini bus up into the Judean Hills to Jerusalem. The weather is perfect in all respects — sunny, warm and dry with a light breeze. I love geology in climates like this. I’m staying in the Three Arches Hotel outside the Old City. 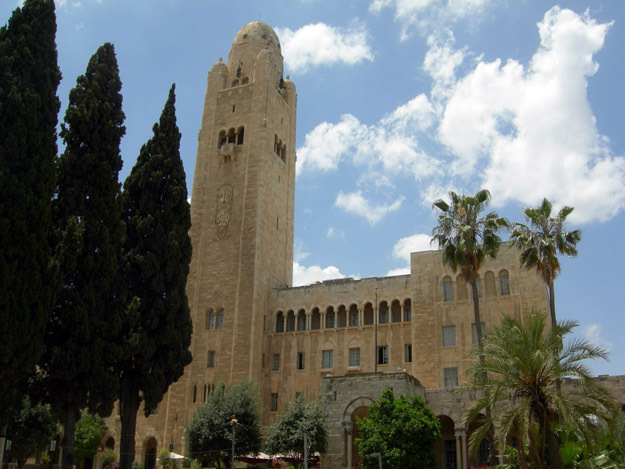 It is a convenient location for walking to the Geological Survey of Israel headquarters and for seeing the fascinating cultural and historic sites inside those old city walls. The first thing I did this afternoon to fight jet lag and try to stay awake was to walk into the Old City and visit the place with the most diverse collection of humanity on Earth: the Church of the Holy Sepulchre. The mix of people and tongues is extraordinary in this dark, rambling stone building filled with shrines. In all the chaos I could immediately recognize my people (the Americans) with their baseball caps and tour group name badges. 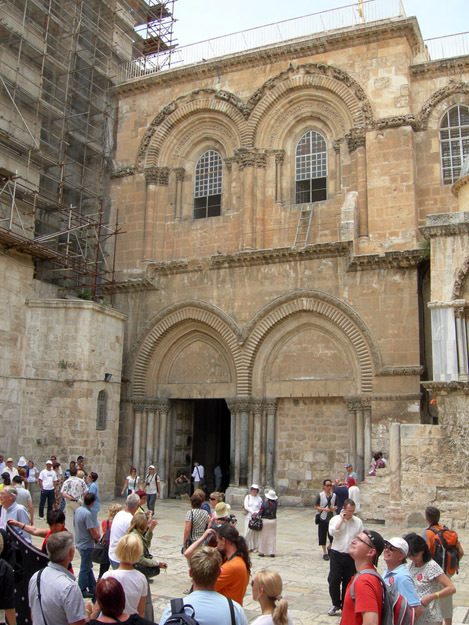 Church of the Holy Sepulchre in the Old City. Through the doorway are hundreds of people packed into dark passageways and rooms. Note the small ladder on the ledge below the upper window on the right. It has been in that exact position since at least 1852 because none of the competing Christian clergy who maintain the church have the authority to move it! Today is Yom Yerushalayim (Jerusalem Day), an Israeli national celebration of the reunification of Jerusalem in the 1967 war. I’ll be watching the light shows and listening to the street music this evening (if I can stay awake). Looks like a beautiful day! What does the street music sound like? Thank you for the great pictures and amazing dialog. I feel like I’m going there with you. Wow, that ladder amazes me! It’s been in the same spot for over 150 years and it can not be removed because the clergy do not have the authority. I’m suprised a gust of wind hasn’t knocked it. Beautiful pictures though, sounds like perfect weather to do some geology.